Misunderstanding about the environment and about the work that goes on in the countryside abounds, often championed by well meaning individuals with the welfare of animals and the conservation of the natural world at heart but without the practical experience or appreciation of the relevance of wildlife management to accept that sometimes humans need to manage the environment rather than just let nature do it's own thing. Mark Avery, former director of research for the RSPB published Inglorious in 2015 criticising grouse shooting and supporting his call for a ban on driven grouse shooting. While he does cite some very credible literature and does make some very good arguments against large scale driven grouse shooting he completely overlooks the benefits of land managed by game keepers. I take a dim-view of 'celebrity environmentalists' like Chris Packham and Bill Oddie who should know better than to make some of the claims they do about grouse shooting and game keepers, although there are some in that industry who certainly do break laws and persecute wildlife the work of gamekeepers is still very important to the character of the British countryside. I do though have a little more sympathy with the kind of environmental 'miss-education' that can occur in schools. 'Environmental Education' is part of the curriculum in the form of topics such as climate change and sustainability and in a 2003 paper about environmental education in Australian National Parks *1 highlights the issue of teachers without the necessary understanding of the environment to deliver effective environmental education. The authors comment specifically that although teachers may have understood environmental issues from a social or cultural perspective they lacked a sound understanding of the ecological and management issues. I have a similar concern having experienced first-hand the effects of misguided people who were concerned about the environment, they had certainly taken a position about the environment and were attempting to influence society which are two of the highest goals of environmental education but their position and action were informed, not by sound fact and local ecological knowledge, but by media and schools where the preoccupation seems to be to presenting global ecological and conservation issues without the context of local issues and badly informed teachers who will preach, rather than teach, about a specific, possibly emotional interest they have in the environment. To put this in context over my years of working in the countryside I have had traps and snares stolen or vandalised, valuable livestock released and been yelled at and verbally abused for cutting down trees and have been reported to the police for carrying out perfectly legal, necessary and beneficial environmental management activities. 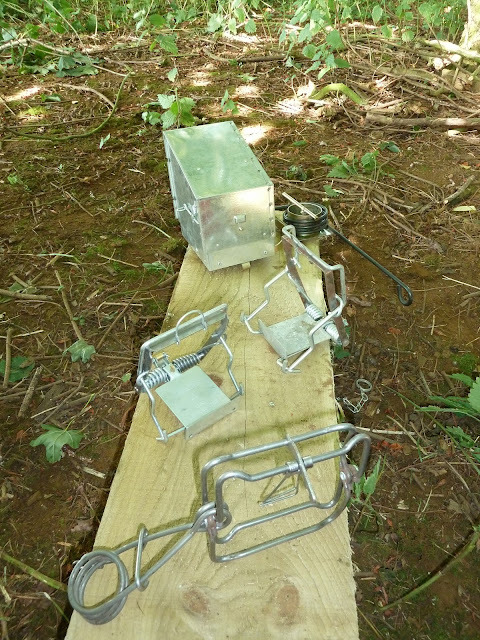 Contrary to popular belief it is still legal to trap and snare many species of vermin and predatory mammals as well as some birds under the conditions of the General Licences as well as use snares which meet certain design criteria under the UK's laws. These traps fill a vital role in controlling species such as grey squirrel and mink but many dismiss them as illegal and cruel without any proper understanding of their role, function or the lengths which have been gone to to ensure modern traps are humane. I do not believe that it is the role of teachers and environmental educators to address the issues or specific difficulties I have faced due to ‘environmental mis-education’ but there should be a responsibility to provide local context for peoples experiences in the environment rather than them forming perceptions of nature and the environment from TV documentaries of exotic animals, deforestation, global warming and other, very important, but very distant and intangible environmental issues. If instead of using the easily accessible, celebrity endorsed, well marketed, neatly packaged but flawed examples of the negatives of wildlife and environmental management teachers were a bit more critical of the material they delivered and were willing and comfortable to step out of the school building onto a local farm, nature reserve, shooting estate, beach or hillside their students would see the day to day activities that go on out there and be able to relate to the climate and sustainability issues in their own community rather than form the opinion the cutting down trees is bad because deforestation in the Amazon is bad and that's all they have learned about at school. Coppice management in a UK ancient woodland, a whole different kettle of fish to deforestation although tarred with the same brush in many peoples minds because they simply don't understand the difference. While I don't expect everyone to suddenly start hunting and foraging their own food after a brush with the environment of their local area I do think that it will be much easier to have those conversations about where food comes from and why shooting and fishing are a legitimate and beneficial way of putting food on the table once people understand how the environment of their local area is maintained and managed. It's not only about food though or the rights and wrongs of killing something to eat but about respect for the people who make a living out of agriculture and countryside management and an understanding of the UK's unique landscape and countryside. As bushcrafters you, and I say you because I am a deer stalker by trade and I train game keepers so to many I am one of the enemy when it comes to their opinions about wildlife and the environment. YOU have a unique opportunity to teach people about those things without being a direct part of an industry that many distrust and find distasteful and can do a great deal to educate people about their countryside. *1 Lugg, A. & Slattery, D., (2003). Use of National Parks for Outdoor Environmental Education: An Australian Case Study. Journal of Adventure Education and Outdoor Learning, 3(1), pp. 77-92.